Brandon Routh is soooo Christopher Reeve. He wasn’t this much Christopher Reeve even when he was Superman. You would think that anyone who hired Reeve – I mean, Routh – post-SUPERMAN RETURNS (after which he was unfairly stripped of the cape), would cast him as a character as far from the Man of Steel as possible, but in DYLAN DOG: DEAD OF NIGHT, Routh is the eponymous paranormal investigator who, like Superman, keeps the peace – between supernatural folk and humans – in begrudging vigilantism; like Superman, his acting style resembles a block of wood and his hairstyle resembles a little Lego man; like Superman, his signature clothing colors are red and blue. And like Superman – he has Jimmy Olsen! No kidding! Sam Huntington (who was Jimmy Olsen in SUPERMAN RETURNS) is here as Superman’s – I mean Dylan Dog’s – sidekick, Marcus! Coincidence? Yeah, and Krypton blew up by accident. From the internationally successful Italian comicbook Dylan Dog (created by Tiziano Sclavi in 1986, publishing its 300th issue in August 2011), this action-horror comedy follows Dylan and his recently zombiefied sidekick Marcus as they track a killer monster through the supernatural underbelly of Louisiana. Someone is peddling vampire blood as a drug to civilians, and Dylan must infiltrate the vampire nightclub to interrogate head vamp Vargas (Diggs). To do this, he disguises himself by wearing exactly what he always wears – but adds a wool cap pulled down around his ears. Of course! Did we expect anything more from a graduate of the Clark Kent School of Disguise? Speaking of superheroes, Vargas must have been watching some old Adam West BATMAN episodes, cos he tries to kill Dylan not by shooting him or ripping his throat out with his fangs – that would be too sensible; he puts Dylan and Marcus in a crypt and rolls a big stone over it. Then he leaves. That oughta work – provided no one rolls the stone off, and provided that they run out of air within two weeks, and that no small animals burrow into their enclosure that they can eat, and that they can’t burrow out, and– oh darn! 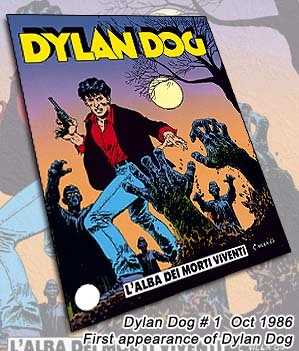 Amongst a host of publishers worldwide, Dark Horse publishes Dylan Dog in English. From reports, the graphic novel is a darker, more surreal vision than this simplistic film. Writers Thomas Dean Donnelly and Joshua Oppenheimer and director Kent Munroe try to imbue the film with interesting sights (a vampire’s coffin outfitted with an Apple laptop, a zombie support group, etc.) but surround themselves with a cast of insipid characters that hold our attention like actors in a car commercial. Taye Diggs and Peter Stormare seem the only professional actors here. Even Routh and Huntington have zero onscreen chemistry, and are then expected to share some of that non-chemistry with vapid blond spinner Anita Briem, brought in as Dylan’s love interest, which would be interesting if Brandon Routh could play someone in love. And say good night to all the day players – they have a great future in car commercials. It’s funny how some movies’ slogans turn around and bite them in the neck. This movie’s slogan: “No pulse. No problem.” Well, this soporific snoozer has no pulse. And that’s the problem. When Vargas turns into a giant supernatural devil named Belial, to defeat Dylan, he doesn’t use any of his presumably supernatural powers, but – like a TRANSFORMER or a TERMINATOR – he would rather grab Dylan and throw him. Even in grabbing him, the fight would be over immediately were he to break Dylan’s back or neck, but no. Throw him. Now you’ve got to go get him again, pick him up again and… throw him again. Royt… All the powers of darkness are at this demon’s behest and he opts for WWE Smackdown? Writers: Tiziano Sclavi, Thomas Dean Donnelly, Joshua Oppenheimer. Starring: Brandon Routh, Sam Huntington, Anita Briem, Taye Diggs, Peter Stormare, Kurt Angle, Kent Jude Bernard, Mitchell Whitfield, Michael Cotter, Laura Spencer, Brian Steele, Dan Braverman.